What Does a Watermelon Plant Look Like? When Is the Best Time to Plant Watermelon Plants? What Is a Yellow Watermelon Called? Is it Safe to Eat Watermelon Seeds? What Month Do You Plant Watermelon? What Time of Year Do You Plant Watermelon? The Watermelon plant (Citrullus Lanatus) is a popular summer vegetable related to cucumbers, pumpkins and squash. It's used for candy, juice, smoothies and as a sweet summertime treat. 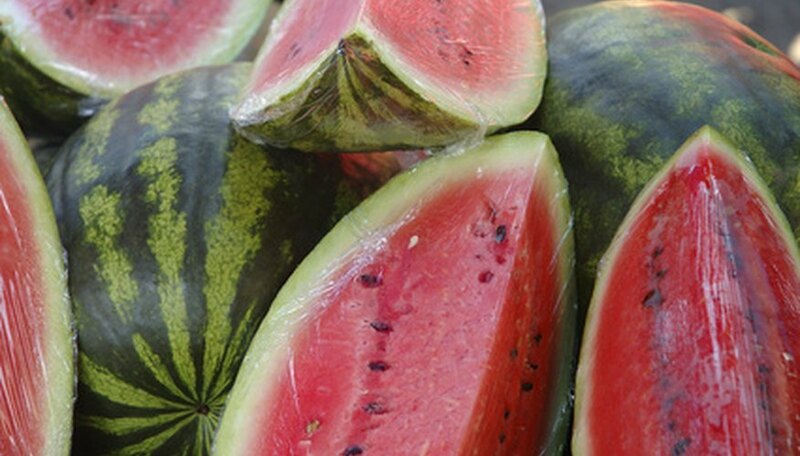 Over 1,200 different varieties of watermelons exist. Their flesh color can be red, orange, yellow, or white. The outside is light to dark green with white stripes. Different types of watermelons range from less than 1 lb. to more than 200 lbs. Popular types such as the Jubilee, an oblong watermelon, weigh around 30 lbs. The Crimson Sweet variety is round to oblong and weighs between 16 to 35 lbs. Allsweet is long with a weight of 18 to 30 lbs. Every part of the watermelon is edible, even the seeds, which vary in color from brown and black to white. Sailors once used watermelons as canteens. Plant Black Diamond watermelon seeds after all chance of frost has passed. Watermelon seeds sprout best when the temperature is consistently above 70 degrees F.
Designate a large area in your garden for watermelon cultivation. Each vine will be approximately 6 feet long. Plants should be spaced 3 feet apart. Clear the area designated for your Black Diamond watermelon patch. Remove all weeds, existing vegetation and rocks. Prepare your soil. Watermelons prefer soil full of organic matter. Mix equal parts of compost and manure into your soil with your spade. Plant seeds 1 to 3 inches deep. Seeds can also be planted in raised mounds or rows. Raised mounds heat faster increasing soil temperature and hastening seed germination. Water thoroughly and keep soil moist until Black Diamond watermelon plants are fully established. Established plants require deep watering every five to seven days. Carefully add a thin layer of mulch to soil after seedlings sprout. Avoid damaging the seedlings. Find a planting site for the Charleston Gray watermelons. They prefer sandy loam soil but can also grow in clay with generous mulching. Wait until after the last expected frost has passed and the soil has warmed to at least 60 degrees Fahrenheit before planting. Make small mounds with the soil about six feet apart, and space the rows of mounds seven to 10 feet apart. Plant a Charleston Gray watermelon seed in the center of each mound about 1 inch deep. Weed the watermelon patch with shallow hoeing. Charleston Gray watermelons should not need supplemental water in areas with a long growing season except during periods of prolonged drought. Water the Charleston Gray watermelon seedlings by drip irrigation if you are in an area with a short growing season. You may also need to surround each mound with mulch and contain it with a black plastic sheet to improve fruit production. Harvest the fruit from a Charleston Gray watermelon plant in about 80 to 85 days. A ripe watermelon has brown tendrils where the stem attaches to the melons. The melon should have a dull surface, and the rind should be resistant to your thumbnail. The bottom of the melon should also turn yellowish when it is ripe. Watermelon plants should not go into the ground until the weather is warm and all danger of frost has passed, usually April or May. Watermelon plants grow best when daytime temperatures reach 70 to 80 degrees F and nighttime temperatures reach 65 to 70 degrees F.
Watermelon with yellow fruit is called "Yellow Crimson Watermelon," although the scientific name, Citrullus lanatus, is the same as the red watermelon. Watermelons are large, vining plants that require extensive space both individually and in patches. Each watermelon plant should have at least 6 feet of space in every direction for growth. Watermelons cannot tolerate competition when they're young, so it's important to weed a site thoroughly before planting. This preparation should also include eliminating any litter and rocks in the area. According to Ohio State University, many commercial growers and home gardeners use black plastic mulch during watermelon planting to suppress weeds from the start. Because watermelons are long, vining plants, they grow easily above the plastic, where they have access to air and sun. An all-natural way to control weed growth around watermelons is organic mulch, which restricts sun exposure and keeps weeds from sprouting. Organic mulch also encourages moisture retention and warmth in the soil. Gardeners who choose to grow watermelons without plastic or organic mulch must monitor their melon patch consistently for competition and weeds. The University of Illinois suggests weekly hoeing and weeding to keep watermelons healthy. Although many gardeners are tempted to use herbicides in their gardens to prevent weed growth, these products come with some serious considerations. They may harm and kill watermelon plants, and as poisons they should never be used around fruits and vegetables meant for consumption. Put the watermelon seeds in a colander and rinse them in cool running water. Add a drop of dish soap, and rub the seeds and soap gently between your fingers, removing the remaining melon as you rinse. Spread the watermelon seeds in a single layer on a piece of waxed paper. Make sure the seeds aren't touching, because they can become stuck to one another and will be very difficult to separate. Place the tray of watermelon seeds in a well-ventilated area for one to two weeks until they're completely dry. Put the dry watermelon seeds in a white envelope, and put them in a cool, dry place until spring. Watermelon seeds are safe to eat. They can be toasted like pumpkin seeds and eaten as a snack. Some believe the cucurbocitrin in watermelon seeds can improve your kidney function. Differentiate between the male and female flower. Male watermelon flowers have a stamen that extends upward, beyond the petals, from the base of the flower. At the tip is an anther, home to the pollen. Female watermelon flowers have a pistil, which consists of an ovary at the base of the flower and a long-tube like structure known as a style. At the tip of the style is a stigma, which receives the pollen from the male flower. Pull back the petals of a fully mature male flower. The stamen needs to be fully extended; it's best to wait until the flower appears to be on the verge of wilting to get a fully ripe, mature specimen. Brush vigorously against the anther with the artist brush to transfer the pollen to the bristles. Don't worry about damaging the male flower--you're merely helping it accomplish its purpose. Take the brush filled with pollen and gently brush against the stigma of the female flower. If pollination is successful a big change will occur in the female flower within days. The stem attaching the ovary to the vine will get thicker and the ovary will point downward. The fertilized ovary will gradually transform into a melon. Plant watermelon seeds in mid to late May, at least two weeks after the last frost. Watermelon plants do not like cold weather. Choose a watermelon vine that is growing past the borders you have established for the plant. Make sure the vine has at least one set fruit. Using your pruning shears, clip the branch just past a leaf. Lift branches that are getting too long but do not have any set fruit, and then lay those branches back over an existing branch. This trains the branches to grow back into the growing area. When you see that a fruit has set, you can prune the branch back. Identify the lead branch, which is usually the first branch to grow from the seed. There should be laterals that sprout from the sides of this main branch. Prune off any laterals that sprout after the first one is allowed to grow. This will allow the plant to grow two long branches. This technique works especially well in long narrow spaces. Plant watermelon in your garden in the spring, after any danger of frost has passed. A watermelon vine will produce only one or two melons per vine. 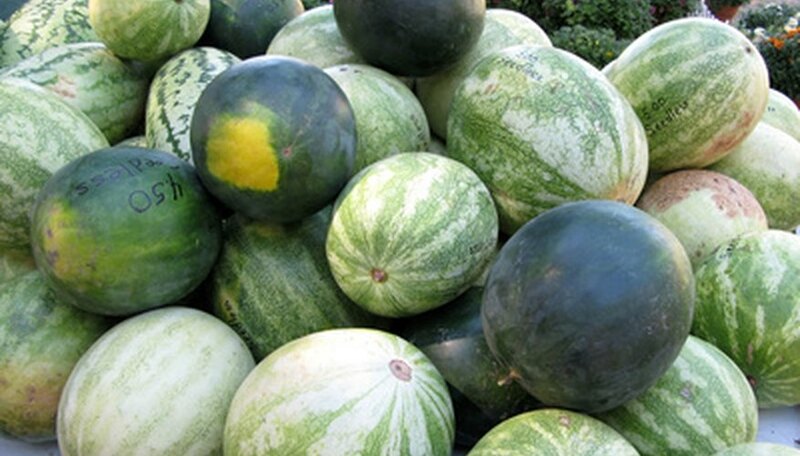 The combined weight of these melons will range from 20 to 30 pounds for large melon varieties and 15 to 25 pounds for smaller icebox varieties. Remove all the weeds and debris from the planting area after the soil has warmed up in the spring. Watermelon seeds are planted outside after all danger of frost has passed. Dig up the soil to the depth of 6 inches with a shovel. Remove large rocks, sticks and tangles of roots. Mix three parts potting soil and one part sand with one part peat moss. This creates a quick-draining, sandy soil with a rich source of organic material. Create a hill 1 foot high and 1 foot wide with your soil mixture. Flatten the top a bit. Using your finger tip, make six holes in the soil, 1 inch deep each. Place one seed in each hole and cover with soil. Do not firm the soil over the top of the seeds to prevent soil compaction. Sprinkle the hill with water. Plant other hills 3 to 5 feet apart. Place a layer of black plastic between the hills to suppress weed growth. Spread a 2-inch layer of straw mulch on the watermelon hills to keep the soil moist and warm. Keep only three watermelon plants per hill once they sprout. 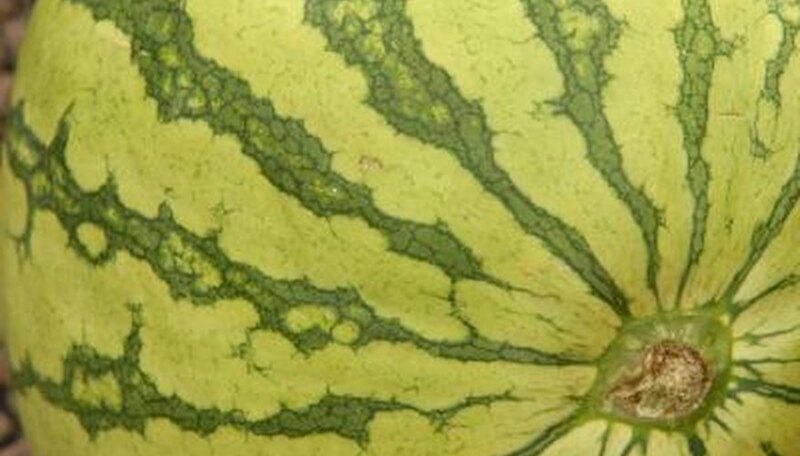 Watermelons are warm weather plants, and seeds are best sown when all threat of frost has passed and the soil has reached 60 degrees Fahrenheit. In northern Indiana, that is from mid-May to June 1, depending on the region. How Many Hours of Sunlight Does a Jalapeno Need?